Is it just us or does it seem like Australia only has two seasons – hot or cold! While the heat has hit early this year there’s no point complaining about it, you need to embrace it with some clever planning… And some help from Outside Concepts in Busselton. One of the ways you can help keep your outdoor living area cooler – so you can enjoy being outside longer and more often – is to install Busselton café blinds. Today’s café blinds can be made from a variety of fabrics, including mesh that keeps the hot sun out of your outdoor living area. At the same time, the mesh lets light in and allows you to see out – how clever is that? While manual roll-up blinds are an option, the most efficient solution is a blind that includes a track-guided system. These blinds can be easily opened and closed and even partly opened, so you have complete flexibility to cope with all conditions. You can even choose a motorised opening system. Café blinds can be used to keep your house cool too! The blinds are available in a wide range of colours to suit any style of house. Café blinds also do a great job in blocking the wind and rain, so they are useful all-year-round. 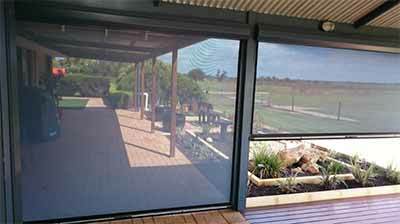 With café blinds enclosing the entire outdoor living area, they can also keep pests out. Contact Outside Concepts in Busselton for a free design and quote on your cafe blinds – and beat the heat this summer!